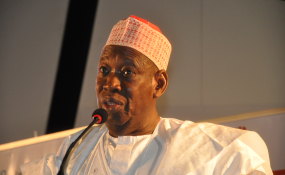 Governor Abdullahi Ganduje of Kano State has thanked the people of the state for re-electing him for a second term. The Independent National Electoral Commission (INEC) had on Sunday declared Mr Ganduje winner of the Kano State governorship supplementary election held Saturday. In the supplementary election held in 28 of the 44 local government areas in the state, Mr Ganduje won by scoring 45,876 votes to the PDP Abba Yusuf's 10,239. He also said that ‎he would run an all-inclusive government that will carry everyone along in the administration of the state. ‎‎The governor thanked the people for believing in his capacity to lead them and for the peaceful conduct of the March 23 re-run election. "We going to complete all projects and initiate new ones and we are also open to new ideas and new vision," he said. ‎The governor who thanked God for the resounding victory urged the people of the state irrespective of their political inclination to join hands to move Kano forward. "I thank all who voted me, those that did not vote me and and those who did not vote at all," he said. "Girl child education, agriculture, women and youth empowerment, healthcare delivery, peace and security will be my focus in the next four years. "As we get ready to start our second term, I urge you to continue to maintain the peace we have so far enjoyed," he said. ‎He commended INEC for its professionalism and also thanked the electorate in the state for re-electing President Muhammadu Buhari.